The SAP Cloud Platform, SAP HANA Service in the Cloud Foundry environment is continually backed up and requires no intervention from your side. A recovery point objective (RPO) from 15 minutes or less is observed. In addition, all backups are encrypted by the cloud provider and replicated in additional availability zones in the same region. In the video tutorial below, we discuss backup (and recovery) for the SAP HANA Service in the Cloud Foundry environment. Recovery is a service request; component HAN-CLS-DB. 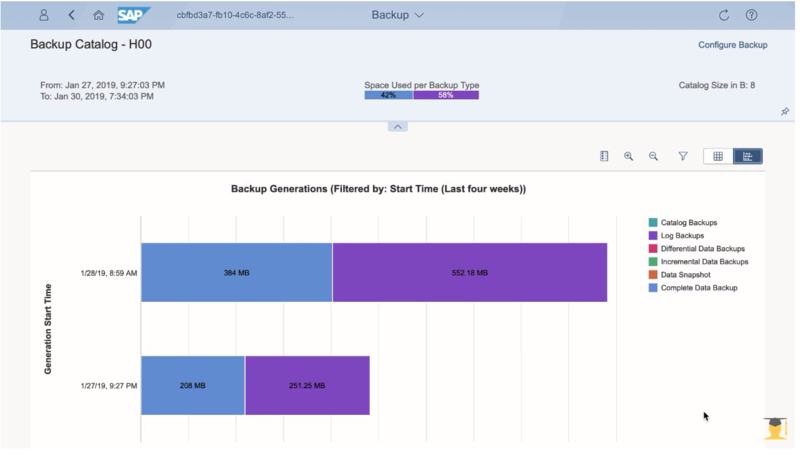 The Backup and Configure Backup apps of the SAP HANA Cockpit for the SAP HANA Service provide detailed information about backups taken, scheduled and their configuration. The edit-mode has been disabled. In the video tutorial below, we discuss root key encryption management in general, which includes the backup root key.